Where I live, the autumn season is really doing wacky things to me. I've been going bed earlier, relaxing on my porch, staring at the leaves, wearing hoodies, and feeling more nostalgic than ever. 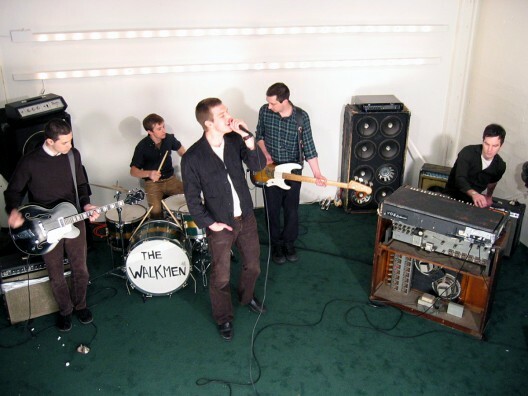 It's the perfect sweater weather climate for these two new Walkmen tracks. I'll admit that I've had difficulty caring much for anything after their 2004 masterpiece, "Bows + Arrows." Their later releases have been solid but just a bit boring for my tastes. However, I've got to hand it to an indie rock band that stays in the game and releases consistently. They've saved a couple gems from their last recording session for their upcoming fall tour. I prefer "Dance With Your Partner," with its classic Walkmen bipolar mood swings. Quiet and tender moments that segue into upbeat waltz movements. "Vermeer '65" gets more of a standard indie rock, folk treatment. Great for chilly October nights. I just have to mention that Hamilton Leithauser's vocals drive me crazy. I've loved this band from the moment I heard his voice piercing through a car commercial, years ago. It's nice that I can always rely on that guy to sing the same on every album. Instantly recognizable, familiar and always a little unsettling.